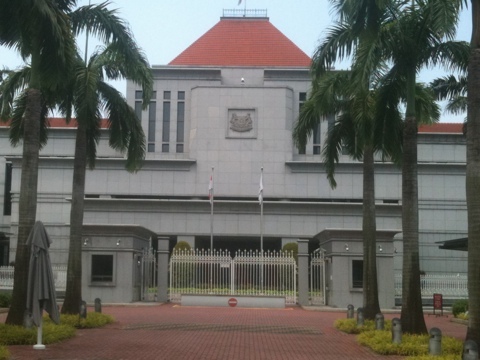 Singapore Parliament: more than three months after the watershed General Election, the House has yet to sit. Be sceptical if you like but keen observers of the Malaysian political scene have remarked to me that Malaysia is much more democratic than Singapore which remains as repressive as ever. Najib also reiterated that there was parliamentary democracy and fair elections in the country. In contrast, the PAP government in Singapore has been accused of gerrymandering but flatly denies it. It’s remarkable that the government continues to bury its head in the sand. PM Najib is apparently proud of democracy in Malaysia but here the word “democracy” remains a taboo with the PM and his Ministers. I can’t recall a single instance when they publicly used the word “democracy” in a similar vein except to claim that democracy is unsuitable for Asian countries. Ironically the National Pledge promises, among other things, “…to build a democratic society…”. But hypocrisy is what The Minister and His Cronies do better than anyone else; it’s one of the few ways in which Singapore brooks no rival among the advanced, rich countries whose ranks it claims to have joined. The difference is that Malaysia’s repression, past and to whatever degree present, was borne out of experienced-based fears, fanned by those who used it for political gain. It was supported, or at least acceded to, not by an individual with a small group of cronies, but by a large chunk of the national society. When enough members of that society saw that the costs of the status quo were so much higher than the feared possibilities of what might happen without repression, they gained enough self-confidence, and national confidence, to put that repression away. Here in Second World Singapore, we have to wait for The Minister to die and for the self-glorification machine he’s built around himself to fall apart before there can be any hope for less repression in Singapore. Whether that “coming apart” follows the Czechoslovakian or Yugoslavian models very much remains to be seen, as will the mechanisms by which we can put things back together and make good on the National Pledge for the first time in our history. This entry was posted on August 1, 2011 at 11:11 am and filed under Malaysia,Politics. You can follow any responses to this entry through the RSS feed. « National Day: majulah foreign talent?